Candy & Fudge Boxes 1/2 lb. Purple - 50 Pcs. (bulk pricing options) 5-1/2" x 2-3/4" x 1-3/4"
Check out Standard Fonts Here! Check out Standard Designs Here! 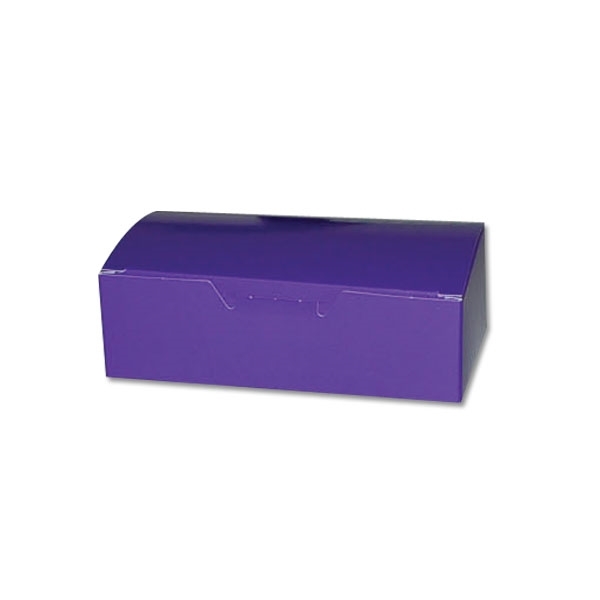 One of our most popular sizes for fudge, the 1080 series of boxes is available in a multitude of colors and patterns. For fudge applications, the box will accommodate slabs or you can pour your fudge into a convenient Plastic Tray (plastic tray # 2701). Economical and easy to set up, this is a great everyday style to use for a variety of chocolate confections such as turtles, chocolate covered berries, bark and chocolate covered pretzels. Also available in the 1/2 lb. size are single layer boxes (one-piece style 1330). The plastic tray (1875) that that fits this item will hold approximately 16 oz. of fudge, or 6 oz. of bark, chocolate miniatures, available in non-window (1330), window (1340) and Easter (4620). Do you sell non-pareils? If so, the solid bottom (1515) series might be your best choice. The sturdy construction of this box won't allow any crumbs to come through the bottom. Die-cut blank construction also offers versatility for Full Case hot stamping and imprinting. 1/2 lb. Plastic Fudge Tray 1 Cavity - Heat Stable 50 Pcs. (bulk pricing options) 5-7/16" x 2-11/16" x 1-3/4"
1/2 lb. Candy & Fudge Boxes - Ribbon N' Holly Candy & Fudge Boxes - 1/2 lb. Gold 50 Pcs. (bulk pricing options) 5-1/2" x 2-3/4" x 1-3/4" 1/2 lb. Plastic Fudge Tray - 1 Cavity / Heat Stable 50 Pcs. (bulk pricing options) 7-3/8" x 3-7/8" x 7/8" Candy & Fudge Boxes - 1/2 lb. Strawberry 50 Pcs. (bulk pricing options) 5-1/2" x 2-3/4" x 1-3/4"
1/2 lb. Candy & Fudge Boxes with Window White - 50 Pcs. (bulk pricing options) 6" x 3-1/4" x 1-1/8" Candy & Fudge Boxes - 1/2 lb. Tangerine Orange 50 Pcs. (bulk pricing options) 5-1/2" x 2-3/4" x 1-3/4" Candy & Fudge Boxes - 1/2 lb. Easter Eggs - 50 Pcs. (bulk pricing options) 5-1/2" x 2-3/4" x 1-3/4" Candy & Fudge Boxes - 1/2 lb. Pink Linen 50 Pcs. (bulk pricing options) 5-1/2" x 2-3/4" x 1-3/4"